Some people say the government is partly to blame for America’s obesity problem – because of the federal dietary guidelines. 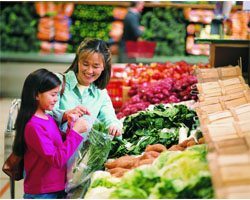 Julie Grant reports on efforts to improve how the government offers nutritional advise to Americans. You’ve probably seen those colorful food pyramids they put out, the ones that tell you how many servings to have of each kind of food each day. Those recommendations are used by schools, nursing homes, and the federal food stamp program to design menus. Robert Post works with the U.S. Department of Agriculture, which puts out the food pyramid. Post says people need to know how to get all the nutrients they need, without over-indulging in foods they don’t need. That’s why the guidelines also set specific limits on things like salt and fat. But some researchers think the guidelines actually have the potential to cause harm. Paul Marantz is professor of epidemiology and population health at the Albert Einstein College of Medicine. He doesn’t think the guidelines should give specific recommendations about how much fat and salt people should eat. Marantz says even a little bit of error in the food guidelines can have a big public health effects. He and his colleagues wanted to find out the potential impact of past dietary guidelines. They looked at 1995, when the nutritionists were telling people to avoid fat. Marantz says Americans did eat more pasta and bread – that added lots of calories, and lots of weight. Marantz wants the government to give general advice for healthy eating, but not specific guidelines. He gives the example of sodium. Marantz says no one really knows how much salt is appropriate for each person. But there’s a push to put specific limits on sodium in the new guidelines. Post says any recommendations for fat and sodium will also be based on the preponderance of current science. The committee is expected to make its recommendations this summer, and new dietary guidelines should be published by the end of the year. These are challenging times for people who run school lunch programs. A national TV show this spring took on the school food system, and now leaders in Washington are debating how much money the country should spend on childhood nutrition. Julie Grant reports. 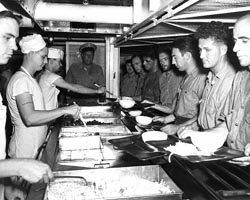 The national school lunch program started after World War II because the military was concerned. Many young men had been rejected from the draft because of childhood malnutrition. Kevin Concannon is undersecretary of food and nutrition at the U.S. Department of Agriculture. He says today former military generals are getting concerned again. That’s because many 17-24 year olds aren’t healthy enough to serve. And part of the reason so many have gone from being malnourished from not enough food, to malnourished from too much junk food, is the school meals program. Everyone from first lady Michelle Obama to celebrity chef Jamie Oliver is pushing for improvements in the foods served in schools. Chef Oliver spent three months in Huntington, West Virginia for his program Food Revolution – because it was dubbed the unhealthiest city in America. In this scene, he started by working in an elementary school cafeteria – and goes with one of the workers to check out the freezer. In his efforts to improve the food in this one school district, we see how many barriers there are to doing something as simple as getting kids to eat vegetables and fruits. There’s resistance from cafeteria workers, the school administrators, the parents, and the kids. When Oliver serves roasted chicken instead of chicken nuggets, most of it ends up in the trash. And when the schools do start using his menus, more and more parents send their kids in with brown bag lunches – many filled with candy and potato chips. Kevin Concannon at the USDA says the government cannot do anything about the lunches parents send with their kids. But it can do something about the food served by schools. And he says there is a big push right now to serve healthier foods. So President Obama is proposing adding 10-billion dollars to school food programs over the next decade. The Senate is looking at adding a little less than half that – 4.5 billion. Either way, Concannon says it’s more money than has ever been added to the program. Chef Jamie Oliver agrees more money is needed to provide healthier foods in schools. But right now, he says the government is part of the problem. It offers schools cheap processed food for almost nothing. The USDA says the government food being sold to schools has improved over the years. But many people say it hasn’t improved enough to ensure that most U.S. students are offered nutritious meals every day. Researchers have known for a while that food labels, such as “low in fat,” can mislead dieters into thinking they’re eating healthy. 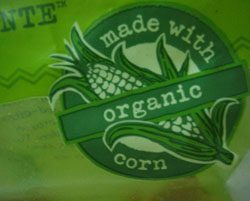 Shawn Allee reports the “organic” label could lead dieters astray, too. Researchers have known for a while that food labels, such as “low in fat,” can mislead dieters into thinking they’re eating healthy. Shawn Allee reports the “organic” label could lead dieters astray, too. Cornell University ran an experiment to look at how people think about food made with organic ingredients. One researcher was Jenny Lee. Lee gave people cookies – some were labeled organic, some not. Then people guessed the calorie count. Actually, they were exactly the same cookies: organic Oreos. The “organic” label means that food’s grown without synthetic fertilizers and pesticides, but Lee says some shoppers think it means “healthy” in other ways. Lee says people need to think about what they expect from food labeled “organic,” since organic products are becoming common in mainstream grocery stores. cafeterias are filled with junk food. The food available in school in Shaker Heights, Ohio looked a lot different a few years ago. They used to sell lots of pop and French fries. Today, we’re standing at what’s called the Nutri-Bar. 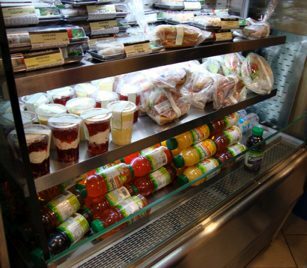 Students can buy salads, sandwiches, even sushi. Peggy Caldwell is spokesperson for the school district. She says a group of parents started worrying about national obesity and diabetes rates among children and pushed for the change. Parents worked with the district to improve the food available in the schools. It’s lunchtime. Students are packing into the cafeteria. A few girls order fruit smoothies at the snack bar. But the line is much longer for the hot meals. Cheeseburgers and pizza are always on the menu. Today’s special: chicken strips and mashed potatoes. That might sound like a lot of fat and salt, but Caldwell says it’s actually pretty healthy. Caldwell says they’re starting to make pizza with whole wheat crust and the pasta is all whole grain. But serving healthier food has cost the district. They had to buy ovens so they could bake. They have to pay more for labor to chop vegetables and make smoothies. And the food, itself, costs more. Fruits and vegetables come at a higher price than those processed foods that are high in sugar, fat and salt. Especially in schools. Schools can actually get 15% to 20% of their food for free through the U.S. Department of Agriculture. Janey Thornton is undersecretary for food and nutrition at the USDA. She says when farmers have too much of, say, blueberries or green beans or ham, the USDA buys those commodities for schools. Then the government offers those blueberries for free to schools. That sounds might sound like a win-win – helping farmers and schools. But lots of times those berries are processed into unhealthy things – like glazed blueberry snack pies – before they get to schools. Peggy Caldwell says the government food presents a challenge. Schools can’t afford to turn down free food. But it’s often high in salt and fat, and at odds with her district’s efforts to provide healthy lunches. Some critics have gone so far as to call the schools garbage disposals for un-sellable farm commodities. Janey Thornton with the USDA scoffs at that suggestion. Thornton worked 25 years in school nutrition at a local district before coming to the USDA. She says the ground meat has gotten leaner, the canned fruit is now healthfully packed in a very light syrup. For those that disagree, debating the federal government might seem like a huge undertaking. But there maybe even tougher tasks for schools encouraging healthful eating, like Shaker Heights. their later years. That land might also go out of farming and into development. Ben and Lisa Sippel want to make sure their son Charlie, born in February, has a chance to continue working their farm if he chooses. their 175 subscribers. Harvests and deliveries go on for 30 weeks each year. 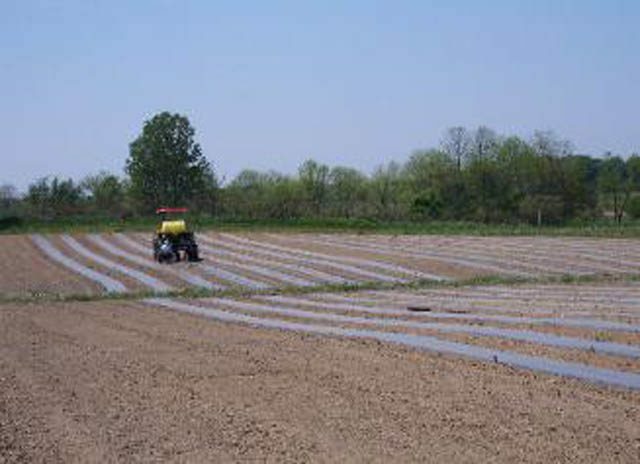 Looking over the acres of carefully cultivated produce and peering into greenhouses where hundreds of tomato, pepper and other plants flourish in the ground, it’s easy to imagine how exhausting and isolating this work is. But standing with Ben Sippel at a farmers’ market where he visits with subscribers and carefully measures out this week’s produce, it’s equally easy to see the connection between grower and consumer. 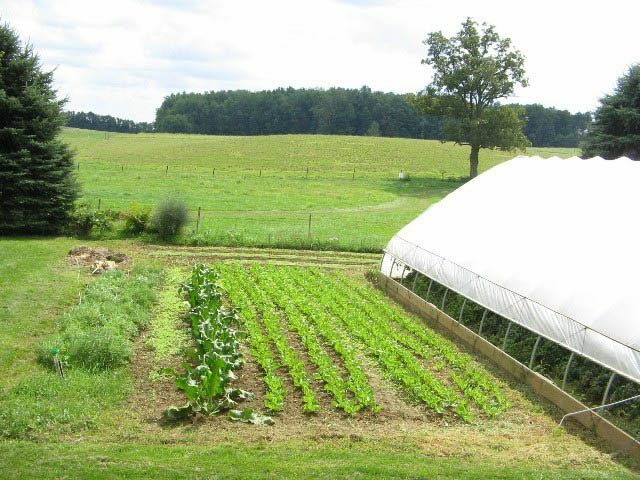 where their food is grown. They’re encouraged to visit the farm. They know if the produce is organic. 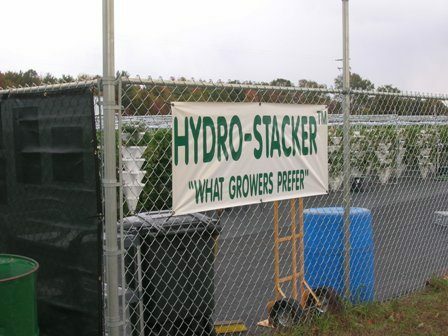 better understanding of what goes into growing that food. the many problems facing agriculture. For the Environment Report, I’m Christina Morgan. You’ve heard of the food pyramid, right? people about nutrition for a long time. Can we move to something else? Okay, so, she wouldn’t say much. the marketplace. And yet they tell us what we should eat. where you have independent advice about what to eat. 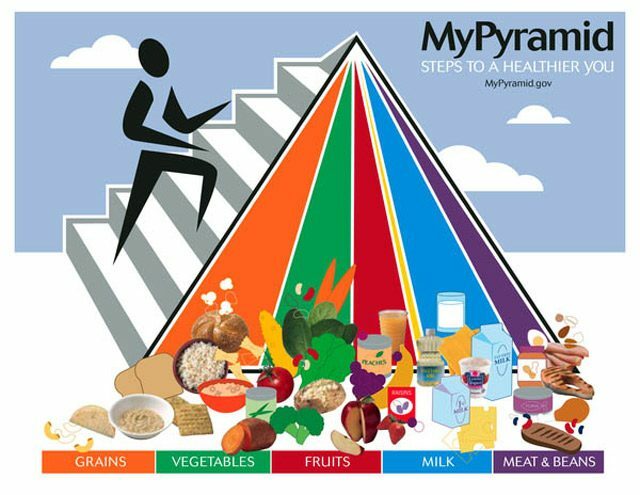 The USDA created the new “mypyramid.gov” in 2005.
system.” About the only way you can get to it is online. spits out a personalized plan. apples in cups. And three cups of milk? “Choose” that. Not very specific suggestions. purpose is to help us eat healthier. what is really best for our health. Murphy says this is a good time to get a peek at Woody’s menu. “I’m looking to give them something that is as close to what their species would get in nature. 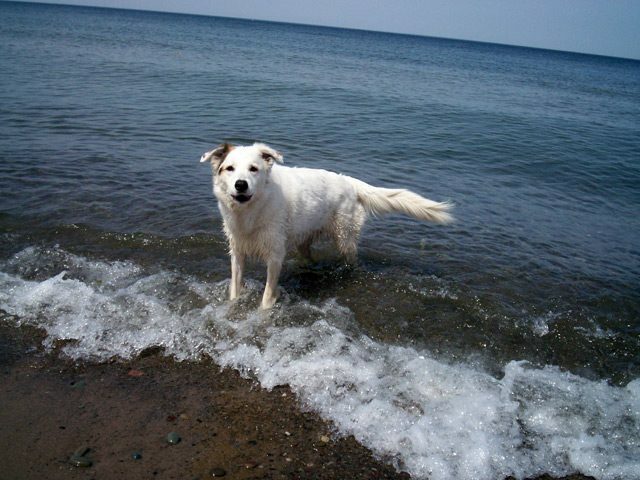 Murphy is certainly not alone in her passion for holistic feeding. scare. She says dogs and cats simply can’t digest grain very well. a small animal veterinarian and a vet for the Buffalo, New York zoo. matter the size of the canine or the cat. She says one of the best ways to find out is to find a good mentor. to share their philosophies… and their recipes. 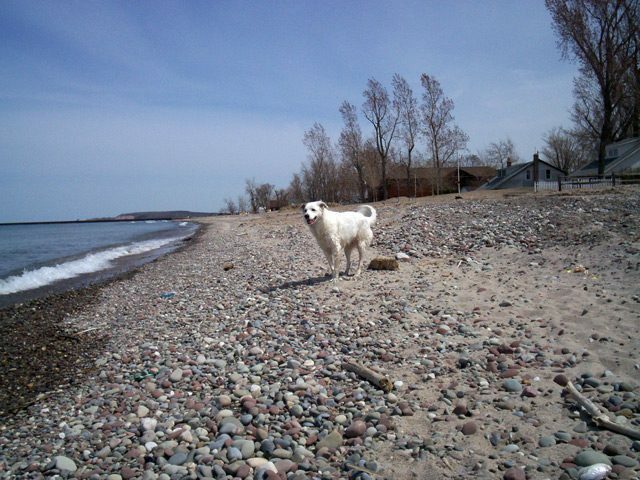 For the Environment Report, I’m Joyce Kryszak. strawberries as late as October. and I’m picking strawberries with Kelly Bowerman. good, seeing as how Bowerman spent 60,000 dollars on them. 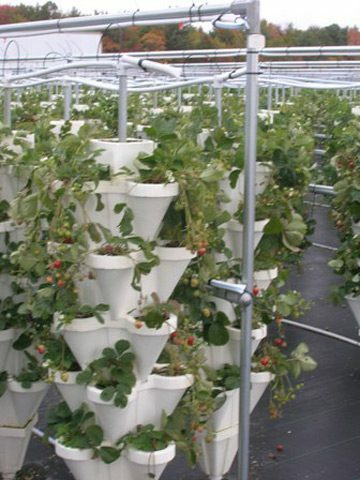 strawberries – will all be under cover in the next 5 years. Of course in the Midwest, “local” is still pretty relative. 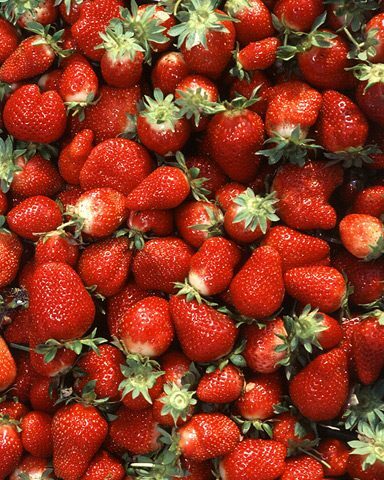 strawberries show up year round at your supermarket. best. They were my favorite. In this cafeteria, there are displays on the wall asking, “What is local food?” and answering, “Foods grown and raised where you are.” Well, that makes sense, but there’s more. Sociology professor Howard Sacks is director of Kenyon College. As recently as the late 1990’s, only a handful of colleges and universities had programs to buy locally-produced foods for their cafeterias. Today, more than two hundred are looking for local farmers for their produce, dairy, and meat products. Most of those schools, such as Kenyon, Yale University, and the University of Wisconsin among the nation’s most expensive and elite. But even some struggling public school districts are making it a priority to buy local foods. Ray Denniston is Food Services director of the Johnson City School District in the Catskills region of New York. 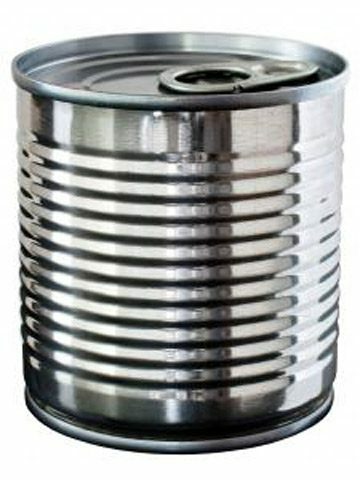 He says a few years ago they served produce that had been shipped from California or Mexico, or they just opened cans. Denniston used to sit in his office and look at price quotes from food distributors. Now he visits farms and negotiates the best prices for local products he can find in season. He says the change started with a few tomatoes. 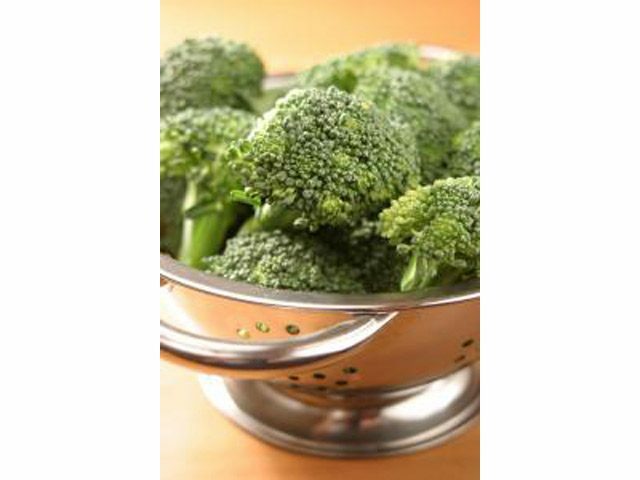 Then came the rich green colored broccoli. It was a big change from what they offered their kids before. Other schools say students love the taste of milk from local farms that don’t give their cows antibiotics. Johnson says cafeteria workers are excited by the fresher vegetables and meats. They like talking with the students about the food, and they like cooking again. Many schools don’t even have kitchens anymore; they only have heating trays for pre-packaged foods. Deb Bruns is with the California Department of Education. She says those heated meals often don’t taste very good and she says they send the wrong message to kids. Many schools start these programs because of nutrition and obesity concerns. By serving fresh, local food, the nutrition lessons continue when the kids line up in the cafeteria. Some schools say prices from local farms are actually lower then national distributors, but they often end up spending more money on fruits and vegetables. That’s because – believe it or not – kids are eating more broccoli, apples, and tomatoes. Researchers analyzed U.S. Department of Agriculture nutrition data from the past 50 years. 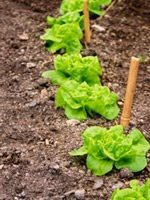 They found that levels of several vitamins and minerals decreased by as much as 38% in garden crops over the time period. Don Davis is the lead author of the study. He’s with the University of Texas Biochemical Institute. He says the decline could be the result of decades of breeding plants to produce more and bigger vegetables. Davis says despite the fact that vegetables have fewer nutrients in them, he says they’re still the most efficient way to get vitamins and minerals into your system.